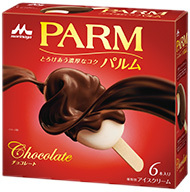 PARM is one of Morinaga Milk's most popular ice cream brands and is well known in Japan as an ice cream for adults. The units of PARM sold in 2012 is eight times that of the units sold in 2005. I really appreciate consumer response toward PARM. The secrets to the smooth texture of PARM are the lower than usual temperature of the freezing process and the rapid hardening. We adjusted the melting point of the chocolate coating to a level similar to that of body temperature. Doing so creates the extra creamy texture like that of ganache. Morinaga Milk received the 24th New Technology & Food Development Award from the Japan Food Journal for creating the technology. Morinaga Milk started product development for PARM in 2003. The target was to create a new ice cream product that could satisfy discerning adult consumers. To achieve the extra creamy texture for this ice cream, we collaborated with Morinaga Milk's Engineering Research Laboratory to alter the freezing process, which critically affects texture. We carried out numerous trial production runs to achieve the best possible taste and texture. We also strived to make the ideal soft chocolate coating. We carefully selected the ingredients and, through trial and error, we finally developed the right formula to create a smooth melting soft chocolate coating that does not crack or peel off. At times, I became quite nervous, but my supervisor and the plant manager put their trust in my team and gave us the opportunity of controlling the development process. That attitude was really heartening for us. If consumers feel happy with the new products we develop, then we, of course, are happy as well. Consumer comments and opinions about our products are a strong driving force for our development work. Extrusion method is a way of producing PARM by filling in lower than usual temperature and rapid hardening. The common Molding method cannot make a smooth texture as Extrusion method because it pours the ice cream into a mold.